We are excited to receive the award for 2017 Local Choice 1st Place Winner to Have a Birthday Party in Mechanicsville/Hanover Local. We will continue to strive for excellence in providing the best possible experience for your child, family and guests! Come see why we're different! "Pump It Up, was awesome experience! They made my daughter feel really special , also it was well organized and timely. The kids enjoyed themselves and so did I. Great job guys.
" It was one of the most fun experiences for the children we have had in a long time. The party was run smoothly and in a very professional way. They all did an outstanding job! "Had a party for my kids here yesterday ..loved the atmosphere and all the workers did to make sure my children had a great time ..will definitely be doing it again next year." "Had a party for our now eight year old today. We had shopped around and this wasn't the first choice. So glad we made it at pump it up because our son and his friends loved it! They did such a good job entertaining the kids. Such a great experience that some of the bigger children ( parents) actually had to join in. Truly was so much fun thank you again we will be back!" "It is one of my favorite places for our children to play. I recommend it often to friends for birthday parties and pop in play. I really appreciated and enjoyed the sensory night. Any time you have those, we will be there. It is a safe, fun place for any child with Autism to play. Please do more of these events! It is also affordable for families as well - which is so important! Families spend so much on therapy, supplements, supplies/sensory tools, and specific diets for their children....there is often not too much left for fun activities if they are expensive. Thank you for being a great place for our community!" "Our party time was awesome. The team could not have been more helpful. For the facility being loaded with children and adults, I think everything went perfectly." "All party hosts were well-mannered and more than accommodating. I will definitely be more than happy to render their services in the future." "The owner of this Pump It Up was able to book our Girl Scout event at a much more reasonable price for 8 girls, as opposed to a regular party which had a much higher cost for minimum of 15 participants. Thanks for helping us "use our resources wisely". "This place ROCKS!! I have been coming here for a few years with my son. We always have a blast so I decided to have his birthday party here too. Due to some unique needs we have a hard time having a typical party at most places so I was very nervous but every staff member I talked to was VERY understanding and could not have been more accommodating. When I say they were helpful and happy to work with me, I mean it!! Naturally, we will continue to come play here often and the new sign-in system out front is very efficient. 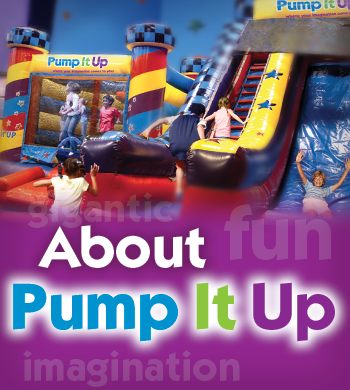 We love Pump It Up!" "We just had my sons' joint birthday party (ages 3 and 5). It was worth every penny spent. The place was very clean, the staff was friendly and polite, and the party was lots of fun. The party staff was amazing and literally did everything from collecting and moving presents, plating food, pouring drinks, and even helped my husband load presents in our car at the end. I highly recommend this place for any party." 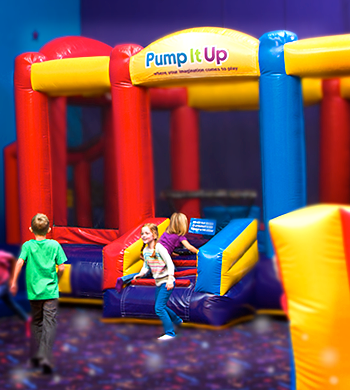 Pump It Up of Hanover has been open since 2005, and was the original indoor inflatable play and party facility in the Richmond area. We've been serving happy families for over 10 years! In Dec 2010, the facility was restructured, enabling families and their guests to enjoy playtime in 2 arenas! In March 2016, we added waiver kiosk for more efficient check-in process. We continue to be the ONLY indoor party facility in the Richmond area hosting completely private parties - private playtime AND private party room time -simply the best for you and your guests! Let's face it, you have choices in the Richmond area and we know it! 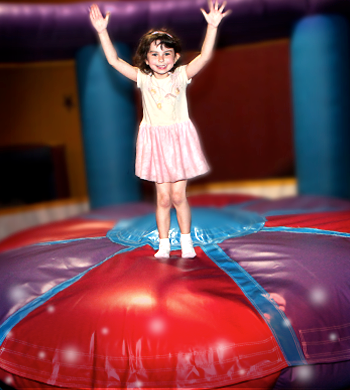 Why should you choose Pump It Up for your party or to come and play? We are the ONLY place in Richmond holding completely PRIVATE parties - your play arena time and your party room time are only you and your guests - no commingling of parties in the play arenas or anywhere else. We think this is BIG because it's safer and definitely special for your birthday child. We stress CLEAN, and our guests have thanked us for it - just take a tour of any other facility and we're sure you'll see the difference. We handle everything, so you can ENJOY the party too! Take your pictures, play with your birthday child, talk with your friends - we'll handle the organization, set up, clean up and the supervision of the kids so you don't have to! You will have dedicated staff with you for every part of your party. Two play arenas - your party PLAYS in both! We are the only facility offering two rooms to play. 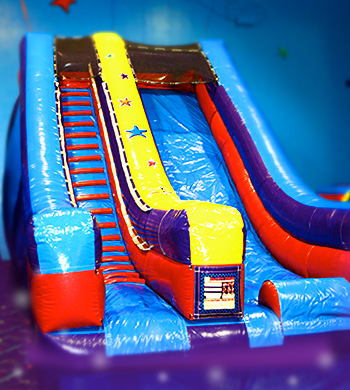 Your child and guest will be excited over and over as they experience double the fun! 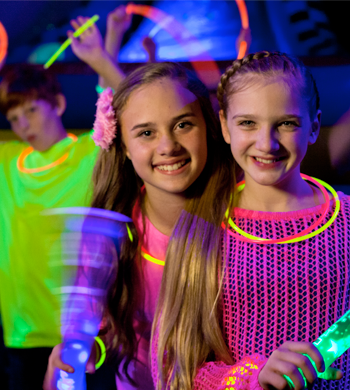 Extra experiences, like GLOW parties keep kids of all ages eager and excited to come to Pump It Up!